A screenshot from ABS-CBN’s television report of yesterday’s raid on Gab’s Videoke Bar in the Sampaloc district of Manila. Nineteen schoolgirls have been rescued and three pimps arrested following a police raid on a Manila videoke bar. 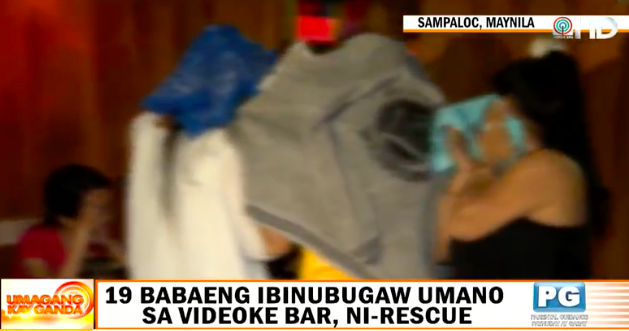 According to a report on ABS-CBN, the police’s Women and Children Protection Center (WCPC) raided Gab’s Videoke Bar in Sampaloc district yesterday evening (Thursday, June 21). Surveillance video showed one of the suspected pimps counting marked money paid by officers who posed as customers. The cash was given in exchange for a girl’s “company”. According to WCPC chief Director William Macavinta, police had previously observed the schoolgirls being offered to videoke customers during surveillance operations. “The girls go to school and work at the club on the side. After their classes, they come here to get clients,” he said. The videoke bar included a stage with a pole for dancing and “VIP rooms” on the second floor. “Their ages range from 15 to 17, maybe high school students. There are cubicles where what the customer wants can happen,” Macavinta said. He added that the three suspected pimps allegedly preyed on students at the school gate to offer them jobs at the videoke bar. “They have a “mother pimp” who would contact them to give them customers,” he said. The raid has prompted the WCPC to urge school administrators to remind their students not to engage in suspicious activities. “Trafficking is a growing global concern so we should all take part in addressing it, including concerned authorities, agencies,” Macavinta said. He also reminded parents to keep track of where their children go to after school. Some schoolgirls, he said, tell their parents they get home late due to “school activities”.